LIFE GOES ON.. AND SO DO DAQMAN’S NAPS! Daqman’s best bet went 82.70 points in profit in a week to recommended stakes when his nap, The Game Of Life (WON 13-8), scored at Dundalk last night. It was his fifth winner in the last seven naps, all odds against but only one of them to maximum stakes as a supernap. THE MASTER MOVES IN ON A GRAND DOUBLE: Daqman also made 16 points on a double at Dundalk, The Game Of Life (WON 13-8) with Chess Grand Master (WON 5-2). An English trainer could win the feature race in France today. Andrew Hollinshead was for many years assistant to his father, Reg, the great handicap trainer and mentor of star apprentices. While home stables, and indeed English racing, are shut down to fend off the equine-flu virus, Andrew’s Chantilly yard is, as ever since he moved to France, campaigning by the seaside at the Cagnes-Sur-Mer winter festival. Today Hollinshead saddles Art Collection in the 6f sprint (at 2.32) and named after the Champion Stakes winner of 21 Group races, Cirrus Des Aigles. Around 3-1 this morning. Andrew was assistant trainer to his late father, Reg, when Tominator won the Northumberland Plates of 2011 and 2013, but had always dreamt of returning to France after a year with Olivier Douieb when he won the Arc with the mighty mare Detroit (1980). He’s captain courageous! Gavin Cromwell sends out three runners to Naas today, where he recently won the Limestone Lad Hurdle with Espoir d’Allen. Cromwell beat the handicapper on the Dundalk Polytrack yesterday with 8-1 shot Nisior Donn, and best chance for his stable in form to continue it’s good run may be Captain Courageous (3.40). I took 22.0 on BETDAQ. Switching, too, from a hat-trick on Polytrack Flat yesterday to the Naas jumping arena is Joseph O’Brien, whose current form figures are 113121. 12.40 Naas Ballymore entry at Cheltenham, City Island would have a hat-trick on his CV already but was disqualified at the Galway Festival between scoring at Punchestown and his Boxing Day reappearance at Leopardstown. He beat Dallas Des Pictons on the last day prior to that one’s Punchestown win in January and Grade-B at Leopardstown last weekend. 1.10 Naas An easy win for City Island (12.40) would boost Fairyhouse runner-up Sky Marshal on collateral form. He was 5.0 in the BETDAQ orange this morning. Debuchet hasn’t fulfilled his bumper promise and Empire Escape may not appreciate this drop back in trip, though there’s every chance that 16.0 offer Pont Aven will. 1.40 Naas Oliver McKiernan, sponsor of this maiden hurdle who trains locally, is hoping a hood can boost the performance of the well-backed All For Joy. There’s money, too, for debutant Royal Thief, ridden by Rachael Blackmore, whose best track this is, percentage wise. It worries me that Edward Harty, trainer of Advantage Point, has gone 232 days without a winner. Scored only in two bumpers the whole season. Fauguernon is entered at Cheltenham but Noel Meade is also treading water right now. 2.10 Naas Pravalaguna, a 138 hurdler, surged past that mark over fences if collateral form for her mares’ beginners’ chase at Limerick is any guide. She led after the sixth and jumped her rivals into the ground. This is a drop back to the minimum but the race would be hard for Willie Mullins to resist, with the conditions of the contest giving her 10st 7lb. 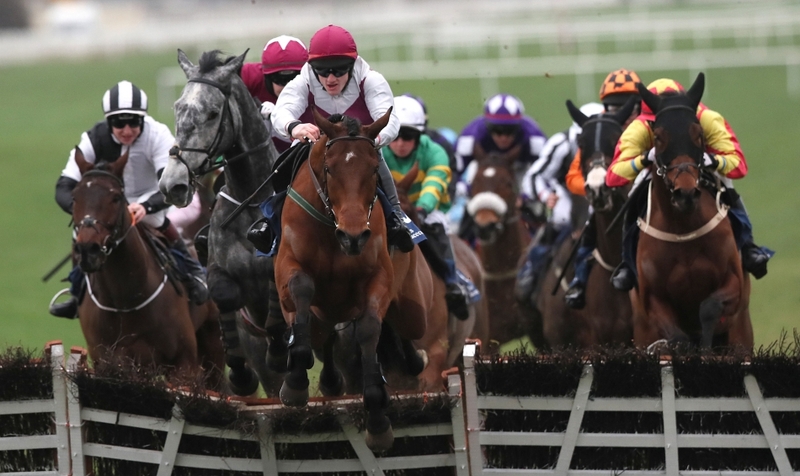 The trip is also inadequate for Synopsis and Mrs Lovett and even more so for Baie Des Iles, who is usually seen in the Punchestown Grand National Trial at this time. The ‘D’ for distance winners on your racecard for Baie Des Iles and Synopsis both apply to hurdles. So, all told this is as strange a two-miler as I’ve ever seen. But last year’s winner was also trained W Mullins and was also a winner over 2m 4f coming into the race. That’s Pravalaguna proofed. 2.40 Naas Four of the six starters have Triumph Hurdle entries, with Konitho and Band Of Outlaws the first of seven runners here today for Joseph O’Brien, who could win with the stable cat right now. He and Mark Walsh are 50% at Naas. But Gordon Elliott also has two – Coko Beach and the keen-going Elysian Plains – and Willie Mullins has confidence in just the one, Maze Runner. Is there any collateral form? Well, Maze Runner was under pressure to win on soft-heavy at Cork in early December, with Band Of Outlaws closing him down to about a length but giving the race away by poor jumping at the last three flights. Maze Runner couldn’t cope with Grade-2 company on better ground at the Leopardstown Christmas meeting (ex-French Coko Beach also well beaten but on his Irish debut). A long way behind in the Cork race was Havingagoodtime, a surprise winner at 25-1 later in the month at Fairyhouse, when Lethal Steps (mistakes) was a moderate fifth. Move on to Naas a fortnight back and you have better jumping by Lethal Steps, second in a big field but with no chance against the easy winner, Konitho. Lethal Steps is at Punchestown tomorrow but let’s get this race at Naas out of the way first. It all adds up to Joseph Patrick O’Brien again, doesn’t it. Can Konitho stake his claim for Cheltenham or will Band Of Outlaws jump better on today’s ground, despite the stronger company than when he scored at Limerick on Boxing Day. I’ll side with stamina on this tough track in the shape of that ‘huge big horse’ Konitho who ‘jumped great’ at Naas on the last day, leaving Joseph Patrick O’Brien ‘a bit surprised that he’s gone and won like that.’ All quotes are his. 3.10 Naas Scoir Mear has been beaten a total of 367 lengths (plus once pulled up) in nine races since October, 2017, and you have to go back another year since the grey’s last win (a hurdle race at Galway). Since that time he’s gone up a pound in the steeplechase handicap but remains the tipsters’ darling for what he’s nearly done. Scoir Mear was easy to back this morning at around 5.7 in the BETDAQ orange. I’ll take him on today with Navan winner 7.2 offer Nellie Pledge. Liam Gilligan is expecting to ride at 10st 5lb, so getting 19lb from the talking horse.